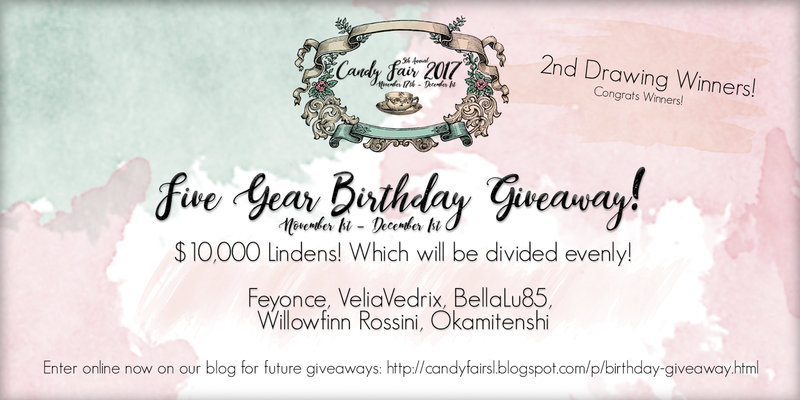 Candy Fair 2017 Birthday Giveaway Drawing #2 Winners! Congrats to the winners of $10,000L! Each winner received $2,000L. Our winners are Sonjastitches, Iwiked, Avrilyn GossipGirl, Ada Forwzy and Smileykitty! Thank you to everyone who entered! Don't worry there are many more chances to win. If you entered for the our previous drawings you are still entered for future drawings. You may reenter your name once daily! Our next drawing will be announced November 9th! Good Luck everyone!